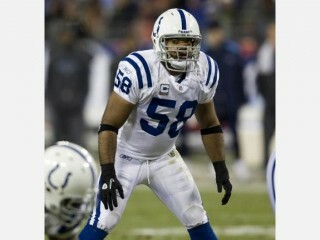 Birthplace : Glassboro, N.J., U.S.
Gary Brackett is an American football linebacker for the Indianapolis Colts of the NFL. Elected defensive captain by teammates…started nine games at MLB…was inactive at Washington 10/17, vs. Cincinnati 11/14, at New England 11/21 and vs. San Diego 11/28…had four tackles at Houston 9/12…had five tackles vs. NY Giants 9/19…had nine tackles and one pass defensed at Denver 9/26…had team-leading eight tackles at Jacksonville 10/3…had five tackles and one pass defensed vs. Kansas City 10/10…had team-leading nine tackles vs. Houston 11/1…had one tackle at Philadelphia 11/7…had 10 tackles and one pass defensed vs. Dallas 12/5…had six tackles at Tennessee 12/9. Defensive captain started 14 games at MLB…was inactive at Arizona 9/27 and vs. Seattle 10/4…had 115 tackles, 81 solo, one sack, seven QB pressures, one interception, one FR and three passes defensed…had five double-digit tackle games and 13 games with five-plus stops…had 10 tackles, nine solo, and two QB pressures vs. Jacksonville 9/13…had 10 tackles and one FR vs. New England 11/15…had season-high 13 tackles, 11 solo, and one interception and one pass defensed at Baltimore 11/22…fourth-quarter interception was inside Colts’ 20-yard line with 2:49 remaining…had 12 tackles vs. Tennessee 12/6 and 12 tackles, one sack and one pressure vs. Denver 12/13. POST-SEASON: Started three games at MLB…had 26 tackles, one sack and two passes defensed…had five tackles, one sack and one pass defensed vs. Baltimore 1/16 in Divisional Playoffs…had team-high eight tackles vs. NYJ 1/24 in AFC Championship Game…had team-best 13 tackles and one pass defensed vs. New Orleans 2/7 in Super Bowl XLIV. Started 12 games at MLB…was inactive final four games after suffering leg injury at Cleveland 11/30…ranked third on team with 113 tackles, 62 solo, and had two passes defensed, one FF and one FR…had six double-digit tackle outings…had 12 tackles and one pass defensed vs. Chicago 9/7…tied for team lead with 13 tackles vs. Jacksonville 9/21…had six tackles and 68t FR at Houston 10/5…68t with 3:36 remaining pulled Colts within three, 27-24, in 31-27 comeback victory…was named AFC Defensive Player-of-the-Week…led team with 12 tackles, five solo, and had one FF at Green Bay 10/19…had 10 solo tackles and one pass defensed at Tennessee 10/27…led team with season-high 14 tackles, seven solo, vs. New England 11/2…had team-high 10 tackles vs. Houston 11/16. POST-SEASON: Was inactive in Wild Card Playoffs at San Diego 1/3. Defensive captain who started 14 games at MLB…was inactive vs. Buffalo 11/12 and at Dallas 11/19…had 123 tackles, 72 solo, two FF and one pass defensed…had four double-digit tackle games and had eight-plus stops in eleven games…had eight tackles at NYG 9/10…had 10 tackles vs. Houston 9/17 and vs. Jacksonville 9/24…had 13 stops at NYJ 10/1 for 3rd consecutive 10+-tackle game…had nine tackles and one FF vs. Tennessee 10/8…had nine tackles vs. Washington 10/22, at Denver 10/29, vs. Philadelphia 11/26 and at Houston 12/24…had eight stops at New England 11/5…had seven stops and one FF vs. Cincinnati 12/18…had 10 tackles vs. Miami 12/31. POST-SEASON: Started four games and had 23 tackles, 17 solo, one pass defensed and one FR…had three stops vs. Kansas City 1/6 in Wild Card Playoffs…had five tackles and one FR at Baltimore in Divisional Playoffs 1/13…had seven tackles vs. New England in AFC Championship Game 1/21…had team-leading eight tackles in Super Bowl XLI vs. Chicago 2/4. Third-year veteran who opened 16 games at MLB in first season as starter…had team-leading 131 tackles, 96 solo, one sack, five passes defensed and 3-50 interceptions…had four double-digit tackle games and 13 games with at least eight stops…had nine stops, five solo, and 2-31 interceptions at Baltimore 9/11…earned AFC Defensive Player-of-the-Week honors for performance…had eight tackles, five solo, vs. Jacksonville 9/18…had nine stops in next three games vs. Cleveland 9/25, at Tennessee 10/2 and at San Francisco 10/9…had eight stops at Houston 10/23 and at New England 11/7…had 10 tackles vs. Houston 11/13, at Cincinnati 11/20 and vs. Tennessee 12/4…had season-high 11 stops, seven solo, at Jacksonville 12/11…had nine tackles, eight solo, and one interception for 19 yards vs. San Diego 12/18…had nine stops, five solo, and one sack vs. Arizona 1/1. POST-SEASON: Started at MLB vs. Pittsburgh 1/15 and had eight tackles, six solo, and one FF. Started one of 15 appearances at MLB…was inactive 12/26 vs. San Diego and started 1/2 at Denver…was reserve LB in nickel packages and on special teams in first 14 games…had 27 defensive tackles, 10 solo, two interceptions and one pass defensed…had stops in 10 outings…had 11 tackles, seven solo, at Denver…had four assisted stops at Detroit 11/25…had three assisted tackles and one interception vs. Houston 11/14…had one interception vs. Tennessee 12/5…was tied for team lead on special teams with 18 tackles…had special teams tackles in 12 games with three vs. Tennessee, two vs. Green Bay 9/26, two at Kansas City 10/31, two vs. Minnesota 11/8 and two at Chicago 11/21 being multiple-tackle games…was named by teammates the 2004 Colts recipient of the Ed Block Courage Award. POST-SEASON: Was reserve 1/9 vs. Denver and opened at LB in package unit at New England 1/16…had eight stops, seven solo, on defense and two special teams tackles…had four tackles in each playoff game. Played in 16 games after making roster as undrafted free agent...had 16 defensive tackles, 10 solo, one sack, one interception and two QB pressures…had 25 special teams tackles, 17 solo, to tie for team lead on specialty units…had defensive tackles in nine outings and special teams tackles in eleven games…had 31t interception vs. Denver 12/21…had four solo tackles 10/26 vs. Houston for top defensive tackle total…had two stops at Buffalo 11/23, vs. New England 11/30, vs. Denver and at Houston 12/28…sack came at Buffalo…had season-high four special teams tackles at Tampa Bay 10/6…had three special teams tackles at New Orleans 9/28, vs. Carolina 10/12, at Jacksonville 11/9 and at Buffalo. POST-SEASON: Was reserve and special teamer 1/4 vs. Denver, 1/11 at Kansas City and 1/18 at New England…had 10 defensive tackles and team-high six stops, five solo, on special teams…had seven tackles, three solo, vs. Denver and three at Kansas City. 2005: AFC Defensive Player-of-the-Week (9/11 at Baltimore). 2008: AFC Defensive Player-of-the-Week (10/5 at Houston). Played in 44 career games…had 274 career tackles and was captain in final two seasons...led team as senior with 130 tackles, second-most in Big East...had 12 tackles for losses, four sacks and three FR…had at least six tackles in 12 games and had double-digit stops in eight games…had 14 tackles, eleven solo, against Pittsburgh…had 14 stops against Boston College…was All-South Jersey College Defensive Player-of-the-Year…was ECAC All-Star...as junior was recipient of Homer Hazel Award as team’s MVP…had four sacks and 14 tackles for losses…was one of three players to start eleven games…had double-digit tackles in four games…saw action in eleven games as sophomore and had 40 tackles, 29 solo, 1.5 sacks, one FR and five tackles for losses…received 12th Man Award as player who made significant contribution on special teams…was walk-on as freshman and played 65 snaps…had 22 tackles in 10 games. Full name is Gary Lawrence Brackett…born in Glassboro, N.J….attended Glassboro High School…was All-South Jersey selection in 1996 and 1997 and was All-Group I and all-conference choice in those two seasons...founded Gary Brackett IMPACT Foundation to benefit children affected by cancer...also works alongside Leukemia and Lymphoma Society with Pennies for Patients program...conducts football camp for kids ages 8-18 in hometown of Glassboro…has one daughter, Gabrielle...resides in Glassboro, N.J.
View the full website biography of Gary Brackett.